Welcome Spring and welcome to my whimsical world. Since today is a day to celebrate renewal and new beginnings, I thought I might briefly write a short share on what started things rolling for me in my life that foreshadowed this new spiral of life I find myself journeying like many of you. Although my parents were not fully aware of the totality of my name’s meaning at the time, or at least that I know of, I find it extraordinary that they chose one with the root being Titania – The Faery Queen. I know they wanted a strong name and one that could also be pronounced in French for our family in France without changing how it sounded. I know they knew it had Russian origins and I think their research, at that time, related it to “princess” or a Russian princess. I’m sure if I’m forgetting anything my mom will chime in since she reads my blogs. 😉 It was obviously meant to be. Some of the things I did as a little girl that link to today include loving and talking to animals – having a way with them that was different and preferring their company, surrounding myself with stuffed animals that filled my bed and floor, easily entertaining myself in my imaginary world while I played on my own, drawing well at an early age and drawing animals mostly, writing creative stories especially about horses – then later in my early twenties I started writing children’s stories and a memoir that I never did anything with, taking ballet and always dancing and being on my toes, singing all the time and was in a choir, dreaming of magickal places, being musical and playing the piano, reading spiritual growth books around 14 after our mom introduced us, getting my very first furry animal companion – a rabbit, and having a lot of strange experiences and encounters I couldn’t explain. Little by little, I stepped away from things, as the other half of the Pisces fish explored what was in the world of others’ realities. Yet, the wonderer fish half never disappeared – she simply wanted to swim up a different stream of energy, while the other pulled up another. And eventually pieces of each were at war, or created separate worlds to live in. After my last divorce, I started exploring more of what the little girl me had first introduced into my life, not simply as a separate or hidden world, but as the one world – recapturing the wanderlust, creative, whimsical, and spiritually inclined me that made connections to everything that moved through me. Reiki, crystals, painting, teaching, more rabbits and a tortoise, sacred travel, integrating past lives, deeper experiences and continuation of extraterrestrial encounters, healing from the inside out, going vegan, immersing in Nature, and more, all hit around the same time of the ending of the marriage and embarking on my own. And in experimenting with each part and different versions of how they channeled through, I honed in on what things I loved best, but also learned that it would take both of my fish halves, to create a life of peace and joy, ability to manifest, and truly live – not just survive. Nature and the Cosmos, along with my rabbit companions, became my way-showers and immersing fully into a nomadic life on the road in an RV where I left an old me in a river up in Alberta, wiped the slate clean to return back to natural harmony. In the end, after both fish explored, they found themselves not on separate streams, but in fact, on forks of the same stream that eventually led back together. This is where I find myself now. A place where painting and creating rabbit whimsy puts me in a place of joy and writing my second book with rabbits as the main characters – my tiny horses of today, challenges me to greater heights, while exposes my deepest vulnerabilities and truth. To wander is to live in wonder and I’m definitely a wonderer. My sweet friend, Mark, of Ravenwood Inspired asked if I could send him a photo of me and the two magickal wands he created for me, as part of “March meet the maker” on Instagram, because I was his first Instagram customer, and first Instagram friend. Mark and I have become dear friends since, or rather rekindled a sweet connection. It was taken the same day as the above photo, and both felt perfect for this post, as a full circle igniting of the new energy and bringing together those two fish parts within me to create harmony and manifest the world of whimsy and wonder, love and peace, and all things magickal that the little girl me stepped into this world dreaming of and the little girl me in woman’s body now, is beginning to make a reality. It’s interesting how it took teal hair, creating a Wonderland room of all of my childhood dreams and loves, and going back to what I loved most as a child, to see a reflection of myself being most me. A portal to harmony. And with the Super Full Moon in Libra, today on Spring Equinox, focusing on balance and the relationships to all things we have in life merging into focus, I feel clarity aligning for what’s to come. Today created a reflection on everything and seeing myself in these photos spoke to a long journey ending and also just beginning. Are you feeling the freshness of possibility in the air? Have any of you struggled with parts of yourselves at war, only to discover they were meant to be great allies? Wishing you a wondrous Spring, as we all sprout the seeds of our dreams and essence a little bit more each day. If you’re on INSTAGRAM, hop on over to our newest post so that you can join Spring’s Giveaway to win this whimsical mini garden and follow the guidelines that will have it traveling to your home. This is our second Giveaway and we hope you’ll find it to be a fun one! Celebrating Spring Equinox we thought we’d share our gratitude for the love you’ve all shown by offering this sweet rabbit mini garden inspired by Spring ($48 value). This is meant to be a creative and fun giveaway and the recipient will be announced on Saturday the 23rd. And don’t forget that today’s also the last day of the 20-25% off Spring Sale on all mini gardens at #themagickrabbit Etsy shop – direct link below. I haven’t showcased this one yet, but with life’s lessons pointing to a need for more balance in our lives collectively, this one jumped out to share in all its sweetness. It’s titled, A Balanced Life is a Happy Life, and it shares the energy of harmony being key and that living life fully, keeping in mind a healthy balance, creates greater well being and enjoyment. Relaxing into a natural flow will align you with the cycles of life and create more peace as you move through experiences. Due to limited time today, as I am immersed in preparations to leave Friday morning for vacation, I thought today’s Whimsical Wednesdays from The Artist’s Corner would be a good time to announce the upcoming official launch of my new Etsy shop and a fun Giveaway that will be taking place in conjunction with it. As you might recall, I shared a first reveal on 12/12/18 of the new artwork and fun creations Astrid and I have been working on. While my previous Etsy shop – that has been dormant and sold out since 2013 – was focused on crystals and my Crystal Illuminations paintings, the new shop will feature a combination of storybook rabbit art, prints, items featuring my artwork to first include greeting cards and blank journals, as well as some really fun and magickal mini rabbit Faery garden kits – oh I can’t wait to share those with you soon! The latter are magickal little themed worlds that you’ll be able to put together yourself! I do all of the procuring and will feature a photo of the end result I’ve imagined, then once you receive the kit, you’ll be able to enjoy the journey of creating it yourself and adding your own magick touches! It’s been a process and I’m still working hard at getting everything I have so far together for the launch that will be on Friday, February 1st! 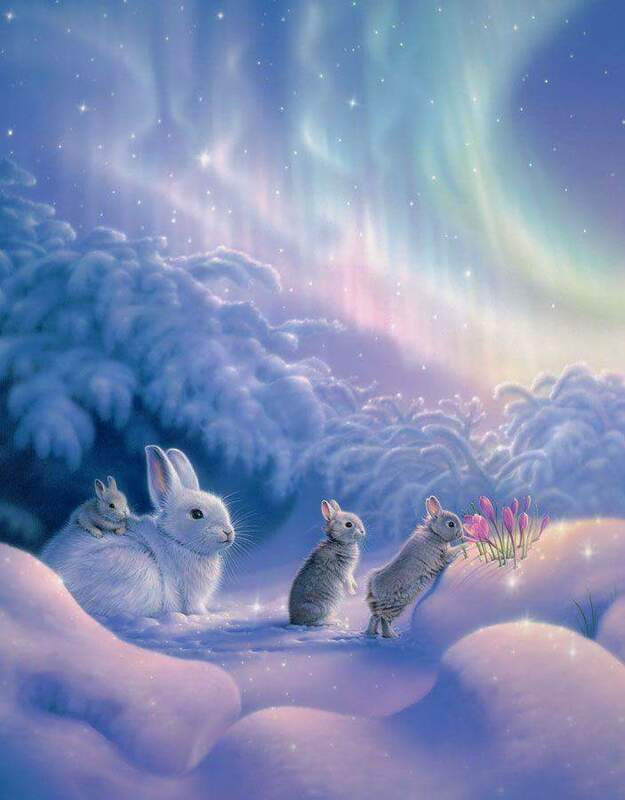 This so happens to be my beloved rabbit twin soul’s birthday (Nestor) and the magickal Imbolc of new beginnings, purification, and the light within blossoming. There will be anywhere from 22-28 mini rabbit Faery garden kits to choose from, alongside the original five paintings I’ve already shared in the link above, and then the items I described with these images on them. I’m currently working on a new collection of original, whimsical rabbit artwork that Astrid is assisting with ideas for. I plan to have fun exploring these more while I’m away in Sedona’s inspiring energy. I’m in the sketching mode right now, but will bring my art book and tools with me to play and keep the channels between Astrid and me open to receive her guidance. These will be different than the first collection and may or may not make it in time for the 2/1 launch, but will be available shortly after, if not. Some of the other potential items I’m looking into creating down the road may include coloring books, tote bags, and mugs. I can’t promise these, but they are in the Faery-works in terms of exploring and discussing the details. Everything is a step-by-step process and I only want to do as much as is fun and flowing, as truly this is purely a joyous project for me to bring these to life and share them with you. They are meant to help rekindle the wondrous heart of your inner child and act as portals to harness sweet magick into your everyday life. I just love expressing and spreading beauty, wonder, and playfulness. I hope they will act as reminders to nurture and cultivate more of the same for you and help whisper a little more enchantment into your life, overall. That leads to the Giveaway. Due to the excited response I received via Instagram when I asked if people would be interested in this, I will be starting a Giveaway on Monday, January 21st on the Full Supermoon Lunar Eclipse. This will be available to anyone who is on Instagram. I know not everyone is on social media, but for those of you who are, you can look for details about this on 1/21. Unfortunately, I can’t run a Giveaway on all three platforms I’m on because it’s far too much to manage, so I chose Instagram. The Giveaway will run between 1/21 and 1/31. I will announce the recipient on 2/1 – the day of my shop launch. I’m still deciding on the gift to give away, but I’m feeling it will likely be one of the mini rabbit Faery garden kits. Again, all details will be on my Instagram page, upcoming. A fun way to share the magick with everyone and my love for rabbits, as way-showers to the wondrous world within. Thank you to everyone who has been so supportive of this new creative venture for me and for the loving encouragement about something that brings joy to my heart to share. Again, this is my last Whimsical Wednesday post until I return the week of the 21st. I’ll see you back here on 1/23 and wish you all a wonderful continuation to your new 2019 creative journey. Today is the first day of December and the start of the last month of 2017 and Lee’s update illuminates the energetic landscape in clear ways. This Sunday we also have a Full Moon illuminating things, so this comes at a good time to clarify your intentions and presence of heart, as you integrate and process what Lee shares about. Some key things he expressed point to creative and heart energy expanding in multitudinous ways right now that will touch the collective in a domino effect. He also speaks about not getting seduced by these “ideas” that your spiritual work is better than what others are doing, as everything can all be heart-based and does have value. Seduction has the tendency to take you away from action, but action is indeed what is needed and is important to help clear things out now – not just talk about it. This is coming in the form of grounding, especially taking place within the spiritual communities, as your work is needed HERE and needing to root in tangible ways that can be of support with the changes taking root. So trust and know that you don’t owe anybody anything. If you take care of you, you will naturally be able to help others. Lee’s thoughts above and in the video, call to mind something I shared in my last newsletter of 2017 just yesterday (and last newsletter for a while). We are reconfiguring things for sure and where it leads is unknown, but can only be navigated by a heart anchored in love. 2018 feels to be ushering in a greater experience of what this “togetherness” means through a deeper exploration of the quality of life we each choose, which I sense will bring even more focus on emotions surrounding dramatic opposing paradigms for us to learn more about ourselves and these seeming contradictions running amok. In so doing, we’ll continue to find that answers can only be sought within, that heart and mind are BOTH needed, and that there is a new way uprising within all of the turmoil surfacing to induce expansion. I couldn’t NOT post this beautiful image that a friend sent me saying she thought of me right away when she saw it. I’d say she knows me quite well, as if this image isn’t me, I don’t know what is. I get lost, or rather, I find myself in the magick, innocence, inspiration, enchantment, ethereal mystery, and love it conveys. It reminds me of my time in Iceland and of so many elements of life and creation I hold dear. I could write a story about all the things this image brings up and ignites within me. But instead, I thought I would share it, as it just twinkles with magick and invokes a sense of wonder and imagination. Powerful things for us to cultivate in our lives in order to harness our creative alchemy into manifestation of being. Don’t stop believing. And DO start living as if everything is a miracle, because it IS and so are YOU.